Ten years ago this June. I had just finished my freshman year in college, and was in D.C. visiting my sister. 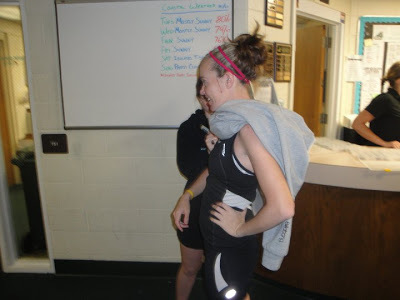 That weekend, Holly was going to compete in her first ever triathlon in Columbia MD, and I was going to tag along. The night before the race we drove up to the expo. I remember two things about that night clear as day: the first being when Holly ran the rental car straight into wall of the parking garage while trying to park (haha, sorry sister!) and two , was the feeling that I might as well be at a Star Wars convention, because all of this stuff was so foreign to me. I had just spent the last 9 months in school, practically pouring alcohol down my throat, playing epic games of beer pong and flip cup, and struggling to make it to class around those pesky hangovers. Exercise in general was not on my radar, never mind something so crazy as a triathlon. I looked around at all of the fancy bikes, all of these nutritional supplements, and spandex/Lycra as far as the eye could see and thought “hey, whatever floats Holly’s boat”. This was not my scene. But I was a supportive sister, and was looking forward to watching Holly race the next day. The next day came ridiculously early. I couldn’t believe we had to be at the start before the sun even came up. To be honest, I never even felt that spark of energy, of pre race excitement in the air. And while I cheered for Holly, watched her cross the finish line with a smile on her face, I was very happy for her, but never quite “inspired” by my surroundings or these athletes. A whole year of guzzling beer and eating pizza had left me with the infamous freshman 15 and then some. At that moment, the idea of even running a 5k seemed impossible. A triathlon just didn’t seem like anything I’d ever do, never mind ever want to do. My, my, my how the times have changed. I really don’t remember when the tri-bug planted it’s little seed into my head. Probably sometime after I took up running in 2007. 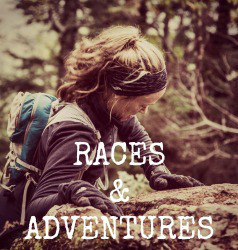 At some point in this love for endurance sports we almost all ask ourselves “what’s next”. For me, that something has always been a triathlon. I took my first step and registered for Iron Girl sprint triathlon in 2008, but was quickly sidelined with a surprise embryo on board (now 18 month old baby Kain). 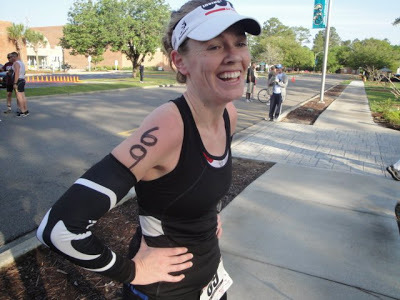 I tried again to work up the courage for a triathlon in 2009, but new mom of 2 kids exhaustion coupled with a very tight income sidelined the dream again. 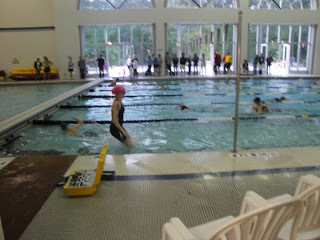 Summer of 2009, I once again made a trek up north to watch my sister attempt another first. Ironman USA. Spending an entire week watching a town full of triathletes was inspiring enough, but sitting at that finish line at midnight, watching people who have been on the course 16+ hours did me in. I HAD to do a triathlon. It took another 6 months to get the plan in motion, but for those of you who have been reading my blog for a while know, I finally started to get the ball rolling. I threw myself into the pool, finally dropped the money into a road bike, hired a coach, and got to work. 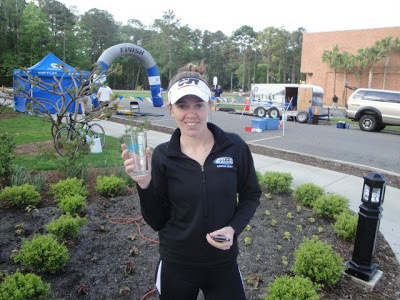 I somewhat stuck with my training (I’ll give myself a B- on training consistancy, yeah I’m pulling the busy-mom/student excuse card) and signed myself up for the 18th annual Coastal Carolina University sprint triathlon. There would be no turning back this time. Yesterday, the day before the race, I was a bit of a mess. I tried to stay calm, really I did, but a fly on the wall in my house could tell you otherwise. Heck, Rich and the boys, who all tip toed around my self-induced chaos could tell you other wise. There was a moment when I was convinced that my $20 walmart floor tire pump wasn’t reading the tire pressure correctly. Rich, trying to calm me down, assured me it was OK. I assured him it most certainly wasn’t, and one frantic phone call to my sister later, I found myself at the closest bike shop. I’ll take one incredibly expensive floor pump please! My stomach sunk a little when I handed over my debit card (I tossed two spare tubes in the pile as well, just in case) as I seriously second guessed what an expensive sport I’ve gotten myself into (costs more and more everyday!) The sick feeling in my stomach over spending $60 on a tire pump left instantly the second I attached it to my bike tires back at home and realized there was only 40 psi in them (should be around 120). That walmart pump could have totally ruined my day. I was very thankful to be home alone with the babies and my little sisters dog that night because their chaos kept me distracted. Finally around 10 , after everyone was in bed, I packed and repacked my bag, going over my list a few times. Then I attempted to go to bed. I knew I wouldn’t sleep much that night. I’ve always heard the previous night’s sleep is more important anyways, so I didn’t work myself up about it. Finally after waking up for about the 24th time, I got out of bed at 4:50 am, a few minutes before my alarm went off. Got dressed, forced down some breakfast (I never want to eat when I’m nervous) and loaded up the car. My little sister Cathy came over at 5:15 am (bless her heart!) to watch the boys so that Rich could come and support me at the race without the distraction of chasing two toddlers who like to run in opposite directions at all times. We made it over to the race start where I picked up my chip and bib. I was assigned #69, to which Rich immediately reverted to a 13 year old boy and said “heh heh, you got number 69! !” I rolled my eyes and simultaneously laughed and scolded him in only the way a mother could, but was incredibly thankful to have him there to distract me and make me laugh. I got body marked and we headed to the car to get my stuff. 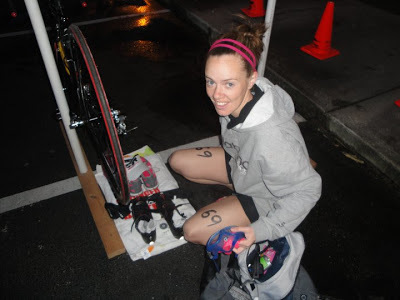 We headed over to transition where I was faced of the daunting task of picking my transition area. This was a small race, with a field of just around 100 people, so there were no assigned spots. For a second, my brain went to the mindset of “well if you are on THIS end then you are closer to the bike exit, blah blah blah, but immediately pushed those thoughts out of my mind. Instead, I picked a spot on the end of the aisle, where I knew I would easily find it, and could spread myself out if need be. This would not be a day for fast transitions, simply because I had no idea what I was doing. And then we stood around for a good 30 minutes. Again, I was so happy Rich was there to distract me from my nerves. Eventually we made our way to the pool for the swim start. It was a zig-zag format swim, with swimmers entering the pool, by number, every 15 seconds. Just a few minutes before 7:00 am, I left Rich and headed over to take my spot in line. Due to the format, I had a good 15 minutes after the start before I could enter the pool. A bunch of people were warming up in the kiddie pool. I told Rich I wasn’t going to because I would be FREEZING when I had to get out. I’m a cold natured person to begin with, but when you add nerves to the equation, I start shaking like a leaf. But after a few minutes of second guessing myself, I decided I needed to warm up so I didn’t totally freak out as soon as I entered the pool. Turns out it was a good idea. I don’t know if half the struggle I have with swimming is because I always get in the pool after a long day at school and I’m tired or what. But this morning, one lap in the kiddie pool (the width of the regular pool) felt EFFORTLESS. My stroke felt spot on, and I couldn’t believe it. For the first time in the past few months, swimming felt natural. I couldn’t believe my luck. And what’s more, that gave me the confidence boost I needed at that very moment. Before I knew it, I had to get in line, and then it was my turn to get in the pool. When prompted , I walked across the timing mat, and ever so gracefully kind of stumbled into the pool. The setup events people kept yelling “FEET FIRST NO DIVING” so that’s what I did, and it was so awkward. I tried to think of nothing but swimming. Not the rest of the race, not think about my breathing, nothing but reach, glide, pull, repeat. 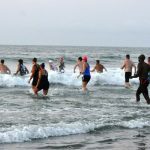 I had a few taps on the toes, which were not NEARLY as scary and as intimidating as I had heard they could be, and allowed those swimmers to pass once I reached a wall. 3 tapping passers, and one that I felt coming up on my heels anyway so I let her go. Only 4 people passed me, which was a huge success in my book. As I turned at the wall for my last 25 yard length, I looked up to see Rich literally walking next to me along the pool. It gave me a boost and I just about ran over the chick in front of me who had passed me a length ago. Before I knew it, I climbed the ladder and was running to transition. Excuse the language, but holy $@#* I survived the swim of my first triathlon! Transition was just as crazy as I expected it to be. Last minute I had thought to bring my arm warmers, and I was glad I did, because it was overcast and barely 60 degrees. And while later I was very thankful I had them, slipping on arm warmers on wet arms is ridiculous. Ladies, remember growing up, wearing one piece bathing suits in the summer and having to take it off and put it back on to go to the bathroom? I hate it. the suit sticks, things get twisted, it’s just a mess. 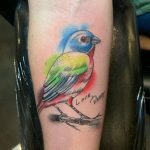 Now picture that on my arms, and you’ve got the idea. Next came Garmin, socks, bike shoes, helmet, glasses. Nope, ditch the glasses, the sun isn’t even out (yet). I had a bit of a struggle pulling my bike off the rack (my darn bag got caught under the wheel) and before I knew it, I was off. Seems like I was one of the last to leave transition, though I knew there were still a few behind me. I crossed the timing mat, then ran a few feet a head and pulled over to the side. 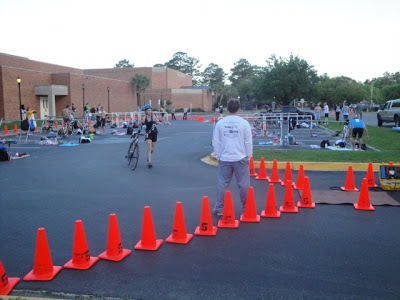 Holly had given me a great piece of advice…that in sprint triathlons a lot of first timers fall off the bike right here, because they rush/panic trying to get on and get clipped in. I’m glad this was in the back of my head, because it did take me a minute to get clipped in. Had I not had the forewarning to not panic, I probably would have fallen. It took me less than a half a mile to feel comfortable on the bike. My goal for the day was to survive the swim, hold my own on the bike, and pass as many people as I could on the run. I never imagined I’d pass as many people as I did on the bike. Granted, probably half of them were on mountain/hybrid bikes, but a good chunk of them were also on road bikes. I am NOT a cyclist (yet) so this really made me feel awesome. The bike consisted of two loops around the campus and the surrounding neighborhood, for a total of 11 miles. There were a lot of 90 degree turns and a few speed bumps, but also many good stretches where I could get into the big gears (that’s what they are called, right? haha I’m such a newb) and really crank out some power. It felt good. The last 200 yards or so I put my bike into the easiest gear and spun, just as instructed by so many people. Needless to say, it didn’t stop the jello legs. I galloped into transition and Rich was waiting right there for me. I put on my sneakers, popped a few sport beans, and was on my way. I wanted to sit there in transition for a little while longer, but told myself to get moving. The first half mile was everything everyone warns you about. It was the most awkward sensation I’ve ever felt while running. I literally felt like I was running at a 15:00 min/mile pace, like I was in slow motion. I glanced down at my Garmin-7:02/ mile. Holy cow, you’ve got to be kidding me. It felt like it took everything I had just to propel my body forward. I slowed myself down a bit, and fortunately this feeling passed quickly. I sank into a good 8:20-ish/mile pace and just went with it. I am pretty sure if this was a Disney movie I’d have birds flying around me and baby deer galloping along side of me, I was that stoked. I smiled for most of the way and just ran at what felt comfortable, yet still somewhat speedy. 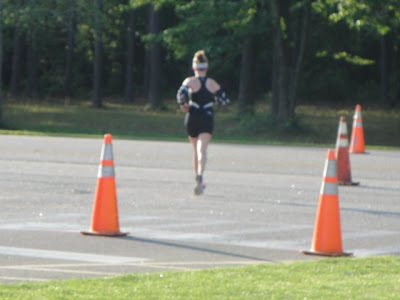 This was not a day for a 5k pr, this was a day for a good solid first triathlon finish. My breathing was somewhat labored, but all of this training is slowly paying off. Because just as much as my physical strength is improving, so is my mental strength. I’m learning to push through those feelings of tiredness and know to what point I can hold my own. It feels good. I passed runners one by one and cheered for those passing in the opposite direction who looked in need of a “you go girl” or “great job man!” I ran with a big smile on my face, despite the fact that I could feel the band holding the timing chip to my ankle slowly eating away at my skin. 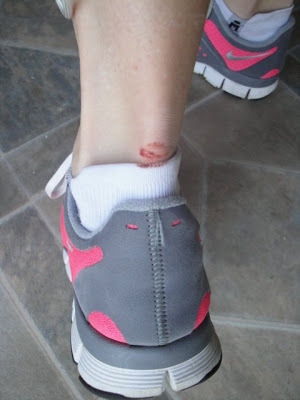 Oh yeah, body glide…oops. Before I knew it, there was the finish line. In the blink of an eye, my first triathlon was done. The fruits of my labor payed off in the form of a 2nd place age group award. Yeah, it was a small field, but with at least more than 3 in my age group, it made me feel pretty awesome. My final time was 1:14:23. I had secretly hoped to come in under 1:15, but didn’t share my hopes with anyone, because I honestly thought somewhere closer to 1:30 would be more realistic. I was ecstatic. At the end of the day, I’m left with a pint glass, a cut up ankle, some permanent marker I still need to scrub off in the shower, and a huge sense of accomplishment. This was the first step to a much bigger dream I have. This was a hurdle that at one point seemed 100 feet tall. And I did it. I’m pretty much on triathlon -cloud-9 right now. And yes, in case it isn’t blatantly obvious by now, I am absolutely hooked. 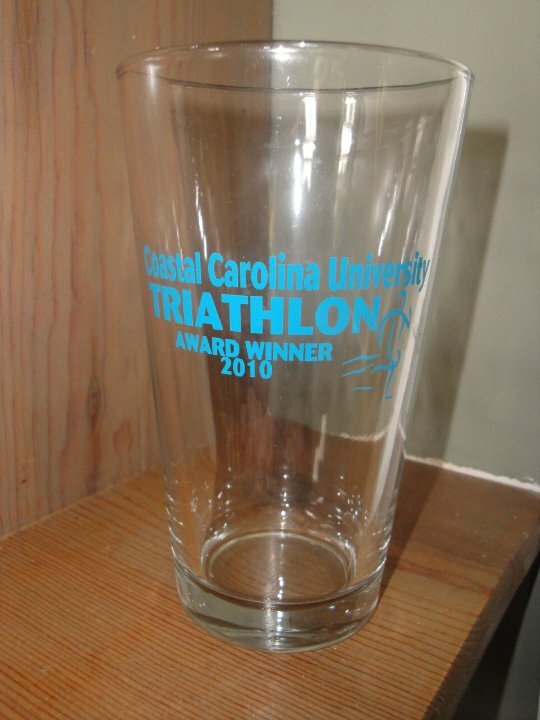 There will be plenty more triathlons in my future, no doubt about it! Thanks for all of the support you’ve all given me, especially my family, CM running moms, and Coach Jeff for not giving up on me every time I skipped a workout (oops!). Thanks for all of the comments, the encouragement, and the advice. It all really has taken me so far. And thanks to you if you have read this far in probably what is my longest blog post ever, haha. I’ll share the splits, transition times, and final numbers as soon as they are posted. One thing I did NOT do well today was remember I was wearing a garmin. I do know I was 59th place overall, out of close to 100 competitors (edit, only 79 finishers). Not too shabby, considering most of them had bikes I couldn’t even fathom affording. Not saying expensive bikes make you a good triathlete, just suggesting they might have a bit more experience than I, haha. And to any of you who have dreams to do something, whether it be a triathlon, a 100 mile ultra or even your first 5k, DO IT. Set your dreams in motion. We are all capable of anything we put our minds to, and I promise you will surprise yourself. your newest multi sport mama friend! Congrats on your first tri! AND the awesome time. 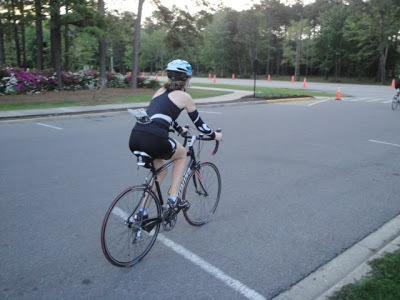 I did two sprint tris in 2008 when I was pregnant. I am registered for one in August and am super excited to get out there sans fetus! Woo hoo!! Congrats on your first one and you rocked it! A W E S O M E!! Many catch the bug, but few actually register and complete a race. Sweet! Congratulations not only for the completion of your dream but for sticking to it, with everything else that comes in the way. Congrats on your journey! Thank you for inspiring me. Mom of 3 myself and started running in 2007 as well. I could totally identify with your journey. Did my first GT12.9 last September (400m, 10k, 2.5k) and came in 3rdAG. Will do my first official sprint tri in June and I’m so scared. 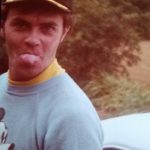 But, reading your blog gave me wind in my sails…thank you! Congrats, Heather!! 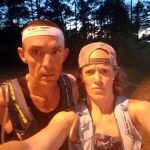 Great race report I must say. I’m scared stiff of doing a tri since I have a fear of deep water and can’t swim to save my life. But, I got nothin’ against a duathalon!! Congratulations! You’re definitely an inspiration. WOW!! I know I already commented on daily Mile but I loved reading the whole story! I want to do one soooo bad but really need to improve my running significantly! Great Job today!! What a great result. You must be soooo pleased with yourself. It’s great when you set a goal and then go smash it. Congratulations! 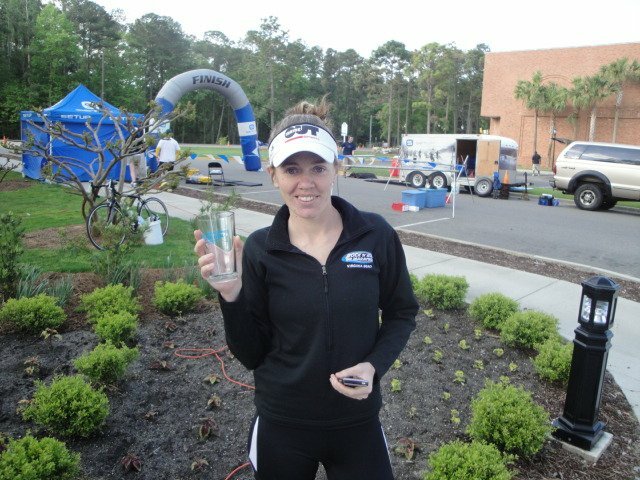 You really rocked you first tri, and an age group award to boot! Woot! I’ve never had that problem with the timing chip. Was it too tight or just rubbing wrong. OUCH! Way to go Heather! I loved your recap. 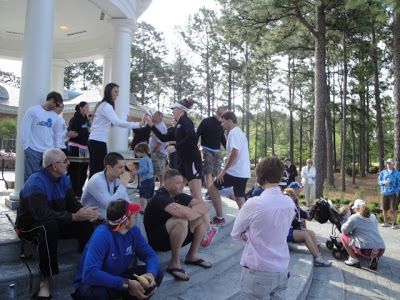 Having never done a tri, I really felt like I was there through your recap. I am sure you are floating on a high still! Enjoy! congrats! you are very inspiring!! Woohoo! Congrats on finishing your first tri! You did awesome! And, yay for catching the tri bug! here’s to your nxt one eh?? Congratulations! Awesome job! Great pictures! Heather, I am sitting in my office at work crying while reading this post. I am so happy for you, so inspired, and so motivated by all of your hard work and sacrifice. Congratulations! Great job! So good to have one under your belt–makes all the difference in the confidence level for the bigger ones. Thanks for sharing this journey with us! Congratulations on an amazing training and being true to the realities of being a wife, mommy and woman. It’s been fun to follow and I can’t wait to see what comes next for you! Great job!!! That is soo awesome and you made it sound sooo effortless! Good for you! ongosh!!! i LOVED reading this post!!! i too had to put my first triathlon on hold due to an unexpected baby!! 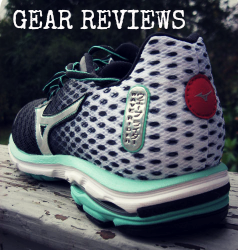 thank you so much for sharing your experience!!! oh yeah and congrats on the 2nd place!!! Reading this today, coincidentally, on the day of the Boston Marathon. My life goal is to run Boston. Thanks for the inspiration. Congrats and welcome to the Tri Side of life! PROUD does not even begin to describe how I feel about you and your first TRI! So lets go with STOKED & “someday” KONA-BOUND baby! 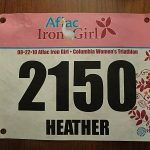 Heather by Qualifying, Holly by lottery or as an IRON/AUNT Sherpa! Okay – kart ahead of the horse, but only a little – GREAT JOB SISTER! 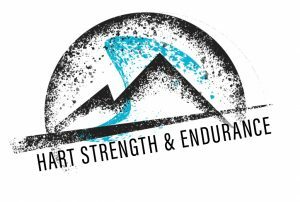 WELCOME TO TRI – MAY YOU NEVER GET BORED OF GOING THE DISTANCE x 3!! Congrats Heather! It looks like you had an amazing time 🙂 Good for you!! totally inspiring!! 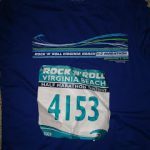 I finished my first 5k yesterday with a goal to not walk at all…did it in 40:38 no walking and primarly treadmill training…which I need to stop doing LOL great blog! Congratulations on your training, your results and your eloquent writing about it all. 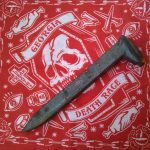 This is an inspiring and motivating post! Thanks for sharing! I look forward to reading about your next tri!! What a great race recap! “Almost” makes me want to do a tri. Almost … not quite – hahahaha. Congratulations! How inspiring! You should be really proud. Oh, and loved the Disney movie reference – I could see the birds and bambi running with you. Major congrats, Heather! That is so awesome. Your bike split rocked!! Congrats on placing, too! I’m so glad you did so well and had such a fabulous time. I am still freaking out a little about my first duathlon this coming Sunday. 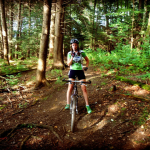 Running seems so easy…multisport seems to have so much room for error, by comparison. But reading your race report really has given me a shot of confidence that my first race can go well, too. WAY TO GO!! I can’t wait to hear about all those other multisport dreams you are thinking about!! Congrats! I am glad you loved it! It is totally addicting, and sounds like you are good at it–2nd place in AG, that is Awesome!